Puppies, pet products, foods, supplies, training, and grooming! Hi there! We’re happy to be back with an awesome new group of puppies who are very eager to meet you! Aren’t you just loving this spring weather!? We’re in heaven and can’t wait to hear about all the adventures our puppies have in their new homes this spring. They can’t wait to find families, so stop in anytime to choose yours! We have two locations and are open seven days a week in both. Ridgewood pups go home with our Lifetime Warranty and their puppy shots completed. We’re also happy to spend as much time as you need, going over training questions and puppy care. We’re also here for you after the sale if you run into any questions or concerns after you take your pup home! Not sure if you’re on track with potty training? Give us a call! Worried that your puppy isn’t eating enough? Give us a call! Wondering if a certain bark means he wants his green or red ball? Can’t promise we can help with that, but sure, give us a call! 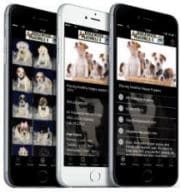 If you’re looking for a new puppy for your family, of course we hope you’ll choose to work with us on finding the right fit! We just love seeing families add more love to their home and are always happy to see our pups find loving homes. Stop in anytime and enjoy the new puppies below! This week, Ridgewood welcomes Cinderella, Snow White, Nolan, Butters, Slipper, Mary Jane, Klondike, Kodiak, Alex, Aliza and Alice! First up we have two very small, very beautiful Shichon sisters! Cinderella and Snow White are just the sweetest. They LOVE to give kisses (like seriously) and are always up for snuggle time. While they do enjoy play time, and are quite entertaining scampering around the play area, these two are definitely well suited to being someone’s companion dog. They are all about laying on your lap for hours and giving you kisses to make sure you haven’t forgotten how much they love you. It’s impossible not to fall in love with these cuties! If you need some happiness in your life and are looking for a four legged companion who will brighten your days and be your bffl, then look no further than Cinderella or Snow White! Call today to make one of these sweet girls yours! Now we have Nolan, a spunky but sweet Cockapoolier puppy! Nolan is all about play time. He takes it quite seriously and you can’t help but have a blast watching him or playing with him. He’d make a wonderful playmate for children because he’s sweet and gentle but is all about living it up, just like kids! He lives in the moment and can’t wait to make everyone who’s around him happy! 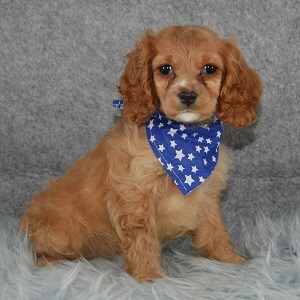 Nolan is a mix of Cocker Spaniel, Toy Poodle and Cavalier King Charles Spaniel. This mix is notorious for quick training, a jolly personality and desire to please their owners. Stop in to meet this awesome little guy today! Up next is Butters the Shichon! This little boy is such a happy little butterball. He is so chunky and snuggly, we want to squeeze him and kiss him all day! 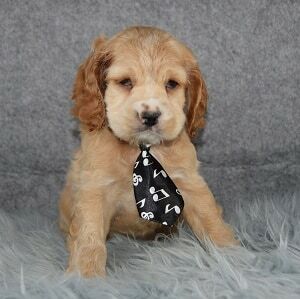 This pup is the perfect choice if you have children. He is all about getting in the action and turning any situation fun, but is very gentle and loves kids. Shichons are a mix of Shih Tzu and Bichon Frise so they are also good for people who have allergies. This little boy can’t wait to start his life with you, so feel free to stop by for a visit anytime to make him yours! Slipper and Mary Jane are up next! These two cuties join their siblings Oxford and Moccasin in the hopes of finding forever homes this week! Slipper and Mary Jane are Shihpoo pups and are two of the sweetest! They are very small girls and love to snuggle! Shihpoos make great family dogs or great companion dogs. They are very adaptable and train very quickly being a mix of Shih Tzu and Poodle. These sisters are very eager to find homes where they might be spoiled and be able to give lots of love so stop in to make one of them yours! 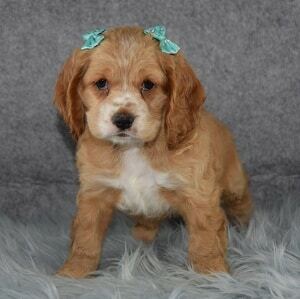 Now we have two beautiful Cocker Spaniel puppies! These gorgeous babies are sooooo affectionate and sweet. Cocker Spaniels are one of those breeds that don’t get enough credit for being the amazing dogs that they are. The word has spread for years that they aren’t good with children, that they don’t train and that they are mean and that just couldn’t be farther from the truth. The TRUTH is that Cockers are amazingly affectionate, they thrive in households where there is order and a true Master, they live to please that master and they are a wonderful breed to grow up with children. Klondike and Kodiak adore kids, love to make new friends and always want to be in the center of things. They can’t wait to meet you and start bonding right away, so stop in today to make one yours! Last up for this week we have three more Shichon pups! Alex, Aliza and Alice are very sweet, very quiet pups who love to be cuddled. They love to play with other puppies, and are great with kids who can be gentle with them. Shichons make great emotional support or therapy dogs and are always so eager to make new friends. This trio can’t wait to be the best pet you’ve ever had and are very eager to start bonding with you! Reserve one of these cuties online today! Thank you for checking out the new puppies! As long as there are pups of age, we have new puppies every Tuesday! Visit anytime we’re open, or give us a call if you see someone you’re interested in! See you back here next week with more pups!